Track and increase the performance of your marketing efforts across every medium with a single tool. Achieve higher rankings in Google and improve customer engagement with a website that works perfectly on any device. Automatically increase and improve communication with your customers and prospects. Setup triggers to automatically follow-up with contacts based on actions they take. Send targeted messages to your customers and contacts. Setup alerts to find out when important contacts interact with your content and marketing. Schedule social posts and automated responses to social activity in your network. All the tools you need. One login. Give role-specific access to an unlimited number of employees. Segment contacts and customers into any number of groups. Track all activity, tasks, and key metrics on a single screen. 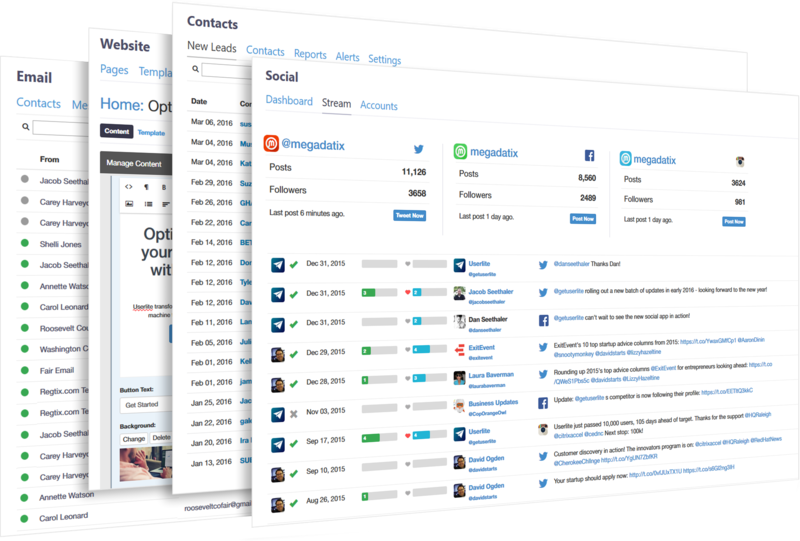 Search across all of your content, campaigns, contacts, and more.